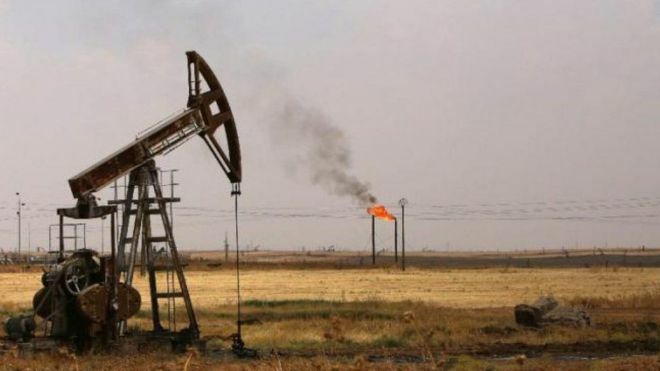 On February 7, 2019, Somalia conducted its first roadshow and unveiled official proposals for selling its oil and gas deposits. The venue chosen was London, England. The goal was to publicize and find two key actors: experts to operate and financiers to invest. What has been unveiled today is the public face of a process (Tender Protocol) that started much earlier. Names associated with today’s roadshow must include former President Hassan Sheikh Mohamoud, whose administration entered most of the binding agreements and his various ministers, and President Farmajo and his current Prime minister as well as other key players in the current administration. That is to say, the February 7-8, 2019 presentation in London is the culmination of a long process that started much earlier. Many past and the present administration have had relatively significant respective roles in this project. Notwithstanding a bad and an incomprehensible presentation by the Minister of Petroleum and Mineral Resources, whose message was lost because of his poor enunciation of the English words, the government could have delivered a better message. There was no need for this man to make the presentation – any number of his junior staff with better command of the language would have been fine. 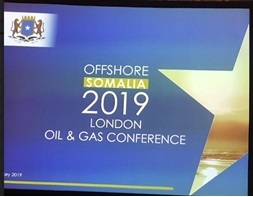 Nonetheless, the gist of the February 7-8, 2019 London Conference on Somalia’s Petroleum was captured by a presentation of about 10 PowerPoint slides. Under the title of “Ministry of Petroleum and Mineral Resources” Somalia’s final proposal for creating a protocol to market its oil was officially put forth. 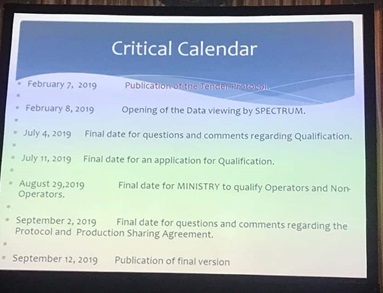 I divide this presentation into two main categories: (1) the first one is the process and the schedule to be followed between now and January 2020; and (2) financial and commercial concepts. As far as the financial concepts availed to us are concerned, they were mainly presented in Slides 3, 5, 6, and 7. Somalis like myself, who are not financial experts, would need more detailed information about these blanket concepts. Then, we can adequately comment the extent to which the sale of the nation’s oil benefits Somalia and its people. So far, we have been given discrete formulas without more details. Intentional or not, key data and explanation on the financial details of the proposal could have helped us gain more understating of what is in for Somalis. 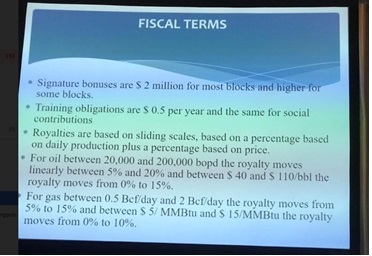 However, the sharing of the revenue by slide 7gives a general clue of how the revenues would be apportioned. That slide states that the percentage of the share that goes to the operators and financiers depends on the level of the risk involved in this venture. Somalia is a high-risk area; Moreover, it is a first-time oil-producing country with no known infrastructure. Because of those two factors, it is plausible that both operators and financiers would demand a higher rate of return for their investment and work. How much they would demand and take home is the only mystery we have yet to unlock. On the other hand, Slides 2, 4, and 9 are meant to explain to us both the process and the schedules to be followed. First, what has been presented is a very tight timeline, and, if you will, one that is unnecessarily streamlined. For a nation that is recovering from civil war and a collapsed state, a proposal with a timeline as tight as this would be detrimental to transparency. The process must have been generous in its calendar and less streamlined. Simply put, people need to comprehend what the government is selling, to whom and by how much. For instance, there are only about 40 days given for processing the Request for Proposal (RFP) – From July 11, 2019, to August 29, 2019. For a project of this magnitude, a minimum of 3 months (90days) and a maximum of 6 moths (180s). I have managed many RFPs and the purpose of giving it enough time is primarily to vet it and ultimately build buy-in of all the stakeholders to the extent possible. Also, the bidding schedule is awfully collapsed into only a few days. The entire bidding process to open the bidding and accept proposed bids will take no more than about 40 days. This again is a short time to bid the nation’s resources. To the outside skeptics, this sounds as if the government of Mohamed Faramjo and PM Hassan Khyre already know who will submit the bid and whatever they ask will be granted. Rolling out Somalia’s oil resources in this manner, especially when the country is labeled as the most corrupt nation in the world, does not help restore trust. Like millions of Somalis, I welcome the effort to utilize our natural resources for our collective common good. The nation needs revenues to pay for its soldiers, rebuild infrastructure and upgrade national institutions. But that should be done in a transparent and more engaging manner. In that aspect, the government failed thus far. Governments are only as good as their engagement with the public is. The more you engage the public the more you receive legitimacy in whatever you do. As it appears, the Somali public has not been properly engaged in crafting the best way to get its buy-in. The following process, or a similar one, and a comprehensive roadshow could have enhanced the government’s ability to get maximum buy-in. 1. The Ministry of Petroleum and Mineral Resources, in collaboration with Ministries of the constitution, Youth, Women, and Public works, and their counterparts in the federal entities, should have created a compressive outreach plan to engage all Somali stakeholder. All these entities of the government have a role to buttress the work of the lead ministry. That Plan should have been shared with the Somalis through mass media and through the centers of our cities. 2. The Plan should have established several large Townhall meetings and smaller subsequent ones. They could have been organized in Mogadishu, Kismayo, Baydhabo, Baltweyn, Cadado, Garowe. Additional meetings could have been conducted in other key cities. 3. The government should have explained in layman’s terms to the nation: (1) what is it that the government is doing; (2) why are we selling our oil now; (3) who are we selling to; (4) how Somalia will be using the revenues from the oil. The public’s input in these meetings would have been part of the design of the government’s sale of our natural resources. An overarching planning concept says that plans and proposal are designed by visionary but ultimately made up in the public. The government failed to meet that threshold. 4. This approach would have reduced the amount of misunderstanding surround this sector and how multiple governments have tried to bring it to light. This was an opportunity missed once again. Therefore, the Somali people have nothing to fall back on except what has been lately circulated in mass media. When the government fails to explain what it is doing, that responsibility goes by de facto to the critics.